But more expansion is needed to hit Germany's 2030 renewables target. Germany’s governing coalition recently agreed to long-promised supplemental tenders that will add a total of 8 gigawatts of onshore wind and solar power to the grid over the next three years. In the coalition treaty agreed to by Chancellor Angela Merkel’s Union alliance and the Social Democratic Party early in 2018, the governing partners pledged to add 4 gigawatts of onshore wind and 4 gigawatts of solar via “special auctions.” Generating capacity added under the auctions is on top of planned expansions under Germany’s amended Renewable Energy Act, which had capped annual onshore wind additions at 2.8 gigawatts in 2019 and 2.9 gigawatts in 2020. The German wind energy industry, among others, had pushed for the supplementary tenders out of concern that the country’s onshore wind sector faces a potential gigawatt-scale “decommissioning wave” as 20-year feed-in tariff contracts expire for existing wind projects beginning in 2020. The governing parties responded. 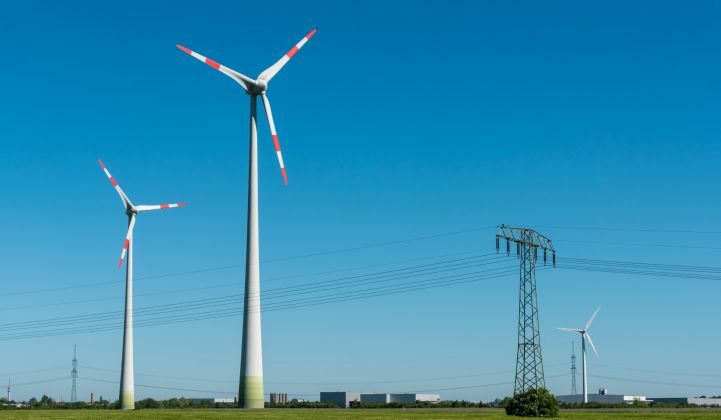 Under an agreement reached by Germany’s Cabinet in early November, the federal government will hold auctions to procure 1 gigawatt each for onshore wind and solar in 2019, increasing to 1.4 gigawatt for each in 2020 and 1.6 gigawatt for each in 2021. The additional renewable energy tenders are expected to reduce carbon dioxide emissions by up to 10 million tons by 2020 and are intended to keep Germany within reach of its 65 percent renewable electricity target for 2030. Experts expect renewables to cover 38 percent of Germany’s electricity consumption this year. Industry organizations and environmental advocates welcomed the supplemental renewables tenders — with some caveats. “It is good that movement [is finally returning] to energy policy. Manufacturers need a clear perspective for the next few years,” said Matthias Zelinger, managing director of Germany’s Mechanical Engineering Industry Association, in a statement (translated from German). Zelinger also called on German policymakers to simplify project permitting and to consider additional tenders for offshore wind energy. “The additional tenders are an extremely important sign for the German wind industry that is currently undergoing a critical period due to a rapid political change from a guaranteed feed-in tariff regime to a tender regime,” Christoph Zipf, spokesperson for the German Wind Energy Association (BWE), wrote in an email. “The decision to maintain the 4 GW additional onshore wind capacity while stretching the tender period to three instead of two years is generally seen as a positive sign by BWE,” he added. “The special tenders for wind and photovoltaics are long overdue. So it’s good that they should finally come,” said Henrik Maatsch, policy adviser, climate and energy, WWF Germany, in a statement (translated from German). Stakeholders have urged Germany’s governing coalition to ramp up renewables deployment in order to meet the country’s 2030 renewable electricity target. “We need more speed on the renewables expansion, otherwise we will not reach the target of 65 percent renewable energy by 2030,” German Association of Energy and Water Industries Chairman Stefan Kapferer said in a statement (translated from German). BWE’s Zipf said policymakers must plan for the long term. “The overall time to plan and install wind turbine projects takes between three and five years. Investments need a clear and reliable planning horizon instead of changing market conditions (first reducing the tendered capacity, then introducing additional tenders),” he said. He added that project developers are seeking certainty on planned renewable energy capacity additions through at least 2030. “With the current expansion rates, the target of 65 percent renewables in 2030 under the coalition agreement will not be achieved,” said WWF Germany’s Maatsch. The organization called on Germany to install at least 2.5 gigawatts net annually, each, of onshore wind and solar photovoltaic capacity. In a bid to promote public acceptance of new onshore wind projects, German utility EnBW recently proposed a plan, similar to policy implemented in Denmark, under which private citizens can invest in projects located near their homes. The citizen investors can invest between 500 euros and 10,000 euros ($570 and $11,385) in projects and receive a guaranteed 3 percent return over seven years.